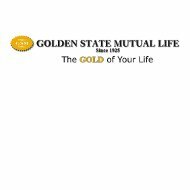 This Golden State Mutual Health Insurance Company Review will actually be discussing the company known as Golden State Mutual Life Insurance. This company was started in 1925 and is based out of Scottsdale, Arizona. Golden State is a part of IA American Life Insurance Company, which is also based out of Scottsdale. Golden State Insurance offers a number of insurance plans, including hospital expenses. If you would like to compare health insurance quotes for health insurance companies in your local area, all you need to do is fill in your zip code in the space provided. One of the main products that Golden State sells is life insurance. The main reason for life insurance is to cover any financial needs that will result from an untimely or unexpected death. When deciding on a life insurance policy you want to figure out the amount that you need and the amount of time you will need it for, then you need to figure out the amount you can pay for the premium. Another reason for life insurance is a way to plan for your future. Golden State offers a number of different products in terms of life insurance. Whole Life policies offer death benefits, cash values, and permanent protection. The premiums never increase and are payable until death or through age 99. The Joint Life insurance plan offers protection for two individuals such as business partners or a married couple. Other life insurance policies include Life 18, Life 20, and Life 65. These offer permanent protection and premiums that are guaranteed for a certain amount of time. The Education 18 is the Life 18 policy with an annuity rider as an added value. Universal Life insurance not only has permanent protection but it also accumulates cash value. This plan allows for flexibility regarding premiums and protection. The cash value growth is tax- deferred and the death benefits are tax free, generally. It also gives you an opportunity to partially withdraw some of the funds from the cash value. This does however reduce the death benefit and cash value of your policy. One of the insurance policies through Golden State is hospital expense. This insurance policy helps with an unexpected injury or sickness. It covers part of your surgical and hospital bills. The benefits of the policy include being able to choose your own hospital or doctor and being able to use it anywhere in Canada and the United States. Golden State also offers disability income, which helps if you have an unexpected injury, or illness that prevents you from working. With this coverage, a part of your income will be paid for by Golden State Insurance. For pastors and church members, the passing of a member of their congregation can result in extra money out of their pockets if the member did not have life insurance. There is an alternative and a solution to family members going into debt to bury their loved one. The benefits of the benevolence plan are positive for both church members and the church itself. Some ways that church members can help are by charitable donations through deferred gift annuities, charitable gift annuities, and life insurance. Contact your agent for more information. Besides life and medical plans, Golden State Insurance offers lending for commercial real estate and mortgage protection. Mortgage protection insurance is like life insurance in order to cover and protect your home. The plan is designed to pay off the mortgage of your home if the borrower passes away. Because only the amount necessary to cover the mortgage is needed insurance wise, the insurance amount will decrease over time as your mortgage amount decreases. To find out more about lending for commercial real estate through Golden State Mutual call the lending department at 323-419-3629. If you would like more comprehensive health insurance, you can enter your zip code in the space below and you will be able to compare health insurance rates for a variety of companies in your area.